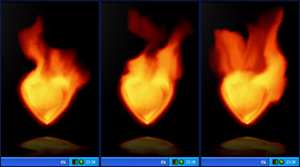 Fire Heart is a desktop gadget that places an animated beating flaming heart on your desktop. The fire effect is unbelievable smooth and looks like a real flame: Features:ive heart beating! Very realistic and smooth real-time fire effect. Customizable appearance options such as adjusting the size and enabling/disabling the reflection and animation of the heart. Additional functionality such as viewing your favorite image, running a program, etc. Desktop gadget that places an animated beating flaming heart on your desktop. Qweas is providing links to Fire Heart Desktop Gadget 2.20.024 as a courtesy, and makes no representations regarding Fire Heart Desktop Gadget or any other applications or any information related thereto. Any questions, complaints or claims regarding this application Fire Heart Desktop Gadget 2.20.024 must be directed to the appropriate software vendor. You may click the publisher link of Fire Heart Desktop Gadget on the top of this page to get more details about the vendor.